The October One Week Challenge (OWC) theme this month was, “It is October 31st and a community is being invaded, however everyone thinks it’s a hoax. Two kids know the real truth… “. The genre was Young Adult. As has been mentioned repeatedly, the OWC is a challenge, not a contest. There are no winners, however, if you take up the challenge to write a script in one you, you are, by definition, a winner. You can read all thirty-one of the winning scripts here. As is tradition, one winning script is selected to be audio performed. The selection process varies. This month, the scripts were selected with the aid of two young adults who read a selection of scripts and picked six, of which three were sent to iScript.com. The folks at iScript.com made the final script selection. The selected script is Mister Schultz’s Zombie Army by Phil Clarke Jr. .
You can read the pdf version of the script here. You can discuss this script and all the OWC entries here. 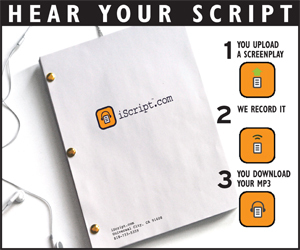 So, turn up your speakers or put on your headset and click the play button below and listen to the script read by iScript.com. Let me know you thoughts on the Discussion Board. Thank you iScript.com for sponsoring the challenge. Coming in December, Sword of Dracula: The Dracula War – Author, Jason Henderson, has been kind enough to release the first six pages of The Dracula War as well as the corresponding pages from the screenplay upon which it is based. Visit the Sword of Dracula page to compare and contrast ‘script to comic’. Two more “For Your Consideration” scripts up on the Movie Scripts page. Thanks to Michael for the heads up. Paramount Vantage has Frohman & Zwick’s September, 2007 draft script of Defiance. Defiance will have a limited release on December 31 of this year so’s in order to be eligible for Oscar consideration. This has Daniel Craig, Liev Schreiber and Jamie Bell as three Jewish brothers who escape from Nazi-occupied Poland into the Belarussian forest, where they join Russian resistance fighters. You can check out the trailer to the movie. Looks pretty freaking epic to me. …with Universal Pictures firing one of the first “for your consideration” salvos. Thanks to Scott for the heads up on this. ScriptGirl’s script report for the week ending October 24th. A race of magical people battle for control of a medieval kingdom, a beat generation bio pic, a woman hires actors to play her family at her wedding, an ex-surfer protects a woman, and a remake of “They Saved Hitler’s Brain”. Wherein writers were challenged to write a 13 page young adult horror script on the theme of “It is October 31st and a community is being invaded, however everyone thinks it’s a hoax. Two kids know the real truth… ” Read the scripts of the writers who were able to meet the challenge. Permalink | Comments Off on One Week Challenge Scripts are UP! Whilst I post up the scripts for the October One Week Challenge, check out what ScriptGirl sez about recent script sales like “Headshot”, “Entering Hades”, Bio Drama of Hervé Villechaize, “How to Rig and Election”, and a sequel to “Wall Street”. That’s it. The entries are in. Stay tuned. Entries (RSS) and Comments (RSS) | 64 queries. 0.205 seconds.